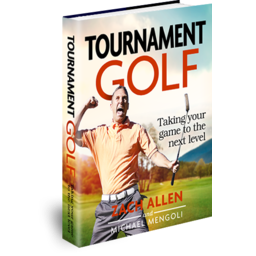 Want to play like a PGA Tour player? You have to practice. Every photo in this story was taken while these players were working hard on the practice tee. He’s already come close to winning a major. He’s a winner on Tour four times, and he’s only in his mid-20s. Give him a few more years, and we don’t doubt Dustin Johnson will have a few major titles under his belt. Why? First, he can absolutely crush the golf ball. So far in 2011, he’s third in total driving distance (307 yards), but we know that’s a conservative number. He can regularly hit drives 10-30 yards beyond that. And as impressive as Johnson’s prodigious length may be, you may be surprised to learn that he’s also first on the PGA Tour in birdies (as of April 2011), averaging 4.68 per round. That’s impressive and couldn’t be possible if Dustin didn’t have a few things working in his swing to make him more consistent. In this case, Johnson is one of the most consistent spine-angle-holders in all of golf. 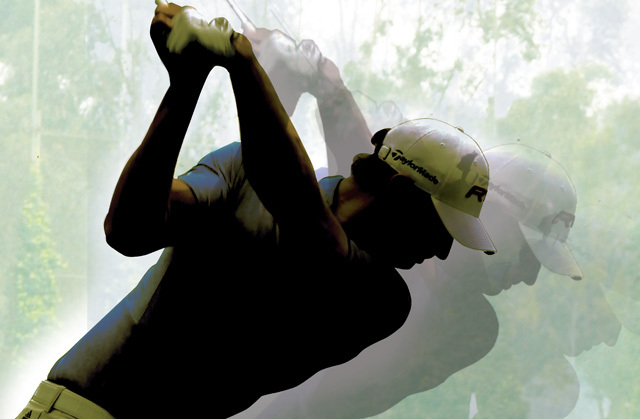 From the top of his swing to the finish, his spine stays leaning forward toward the ball. By maintaining this angle, Johnson can more easily return to the ball without having to lift, dip or slouch at impact. It also allows him to make a bigger rotation. Here he’s hitting a middle iron, and just look at how open his hips are at impact! Try to do the same with your spine angle, and keep it tilted as he does here at impact. After impact, it’s okay to ease up and finish more upright, even though Johnson keeps his angle well into his finish. What’s Hunter Mahan’s secret to hitting nearly 70 percent of the greens every time he plays? His compact, efficient golf swing. In the sequence above and below, Mahan is practicing hitting a middle iron. If you look closer though, you’ll see he has a glove tucked under his right arm. His teacher, Sean Foley, uses this drill often to get players to make a more complete and connected backswing without the arms and club drifting too far away from the body. When that happens, the club can actually get “stuck,” as the pros call it, behind the body on the downswing. This leads to pushes, slices and overactive hands to fix the problem. 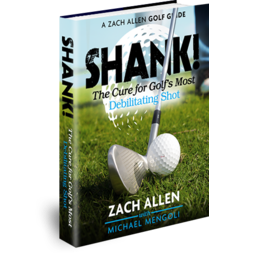 The glove prevents those problems and also helps keep Mahan on perfect plane as he swings back and through the golf ball. Curious to try this yourself? Go for it. Just start slow with some three-quarter shots and work your way up to some longer swings. Luke Donald has one of the most beautiful swings we’ve ever seen on the PGA Tour. It’s so smooth and fluid! But there’s actually a lot more than just beauty behind it. Donald is already having an awesome year, with a win and a top spot among several stats, including scoring (69.28), putting average (1.703) and putts per round (27.43, all as of April 2011). Donald wouldn’t have such great success on the greens and in scoring if it weren’t for his exceptional ballstriking skills. In the sequence above, there’s quite a bit the average player can learn from him. To start, pay attention to Donald’s rhythmic tempo and balance (you’ll have to tune in to a TV broadcast to see what we mean). He knows what it means to allow the club to accelerate through the downswing, rather than do what many amateurs do, which is to try to muscle the ball from the top of the backswing. Second, Donald exhibits two positions in his swing that we should all try to emulate. At the top of his backswing, notice how Donald’s left arm and clubshaft form an L shape? In the sequence above, Donald holds that L from the top of his swing to a split second before impact. After impact, as soon as the arms reach the point where they’re parallel to the ground, the L returns. Thinking in terms of holding the L is a great reminder to hinge the wrists properly on both the backswing and forwardswing. It also allows the body to rotate through the shot (as evident by Donald’s turn and movement to his forward side on the downswing). Furthermore, by thinking of holding the L position and reaching it again after impact, you may find yourself thinking less about hitting the ball and instead swing more freely through the golf shot. He may have one of the most unorthodox golf swings to ever hit the PGA Tour, but Jim Furyk is still one of the best to have ever played in the modern era. Any player can learn from his awesome leg and footwork. As he swings, notice how the right knee drives toward the target? This both helps to ensure a proper weight shift to his left side, and makes it easier for his upper body to rotate through. In addition to some great kneework, Furyk has exceptional balance through the finish, thanks to a solid left foot planted on the ground. Try this, and copy Furyk’s finish. You’ll see instant improvements. Atypical weird and strange, that may be putting Tommy Gainey’s unique swing nicely, but let’s get this straight; it gets the job done. The two-gloved Big Break alum and rising Tour star proves that you don’t need textbook mechanics to play great golf. But there are some positions in his golf swing you’ll want in order to help you hit great shots. In Gainey’s swing, check out his left arm at impact. It’s fully extended, and actually is in line with the shaft. This is an awesome position to emulate. There’s no chicken wing, his body is rotating, and he’s making a strong, descending blow into the back of the golf ball. And check out the back of his left hand: It’s facing the target. Copy Gainey’s impact position and you’ll start hitting better shots. Hitting down the line is a bit of a misnomer. You really can’t do that, since you swing the club from both the side of the ball and in a circle. So what gives? The idea behind swinging with a line, as demonstrated by both Anthony Kim and Jonathan Byrd, is to use the line as a reference point for parts of the body during the swing (and to help with alignment, of course). In Kim’s photo, he’s swinging “down the line” by keeping his shoulders square to the target line at impact while his body continues to the left of the target. Byrd is doing the same (with a shaft on the ground), only his left arm is in line with the club at key moments during his swing. He’s also probably using the club on the ground to better gauge his stance and setup before he hits the ball. Like Kim, he’s rotating against, not sliding through and along, the target line. When you practice with a club, stick or alignment aid on the ground, don’t feel as though you need to swing along it. Use it to check your stance and other positions during your swing. That’s what the pros do. The aggressive, brash and exciting Rory Sabbatini seems to have bounced back en route to winning the Honda Classic this year. Sabbatini’s golf swing has never looked better, and when he’s playing well, he’s easily among the toughest competitors to beat on the PGA Tour. At 35-years-old, Sabbatini has a swing that reflects the motion more associated with classic swings of the ’60s, ’70s and ’80s. His big backswing and wrist hinge is supplanted by a fast unhinging of the wrists and a reverse-C followthrough. What can you learn from Sabbatini? Check out the photo of him just before and at impact. There are two things going on here that you can emulate. First, notice the amount of hinge in Sabbatini’s wrist before he makes impact. This is what’s referred to as “lag” in the swing. More lag tends to mean the hands will release the club really quick and with a lot of clubhead speed. 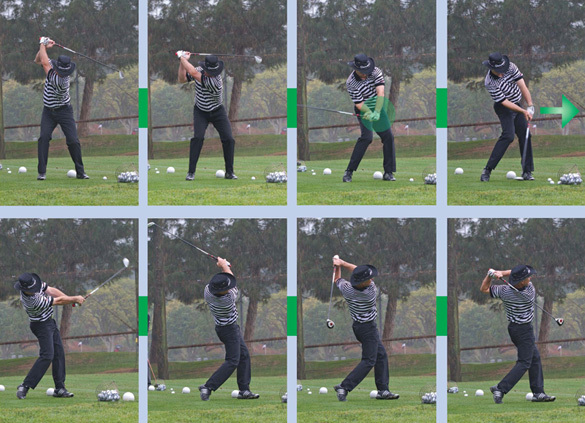 Second, check out Sabbatini’s head position throughout his swing. Not only does it stay stable, but you can clearly see that his head is behind the ball at impact. Upon closer inspection, you can see that his head actually swivels and turns as his upper body does during the swing. 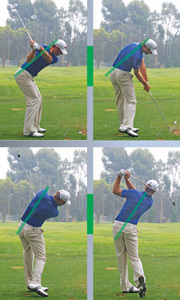 By doing this, Sabbatini can swing more successfully with his arms in front of his chest. If he were to keep his head “down” as some mistakenly say you should, he’d restrict his rotation on the downswing and would not be able to extend as well as he does through the shot. David Duval and Annika Sorenstam do this too, even more than Sabbatini is demonstrating here. Better players often will tell you that the key to hitting better shots is to think of one good element of the swing and try to perfect it. Try keeping your head stable and allowing it to rotate with the upper body. It works! Zach Allen, PGA, teaches players of all levels at DeBell Golf Club in Burbank, Calif. For more information, visit zachallengolf.com. Hi, good morning Zach, I’m from Myanmar(Burma). I play golf a lot. I love golf. I can learn your’s golf lessons from the net. I am 56 years old. start played golf at my age 34. Now I got a lot of lessons from “Youtube”. Now I can reduce my score, at the Tournament, under80. So very thanks to you.